From Italy helping children around the world on Motorcycles – "4 WHEELS CAN TAKE YOU THERE, BUT 2 WILL TAKE YOUR SOUL"
This is the first segment of an epic journey. The goal is to travel around the world from Italy eastward on our motorcycles. 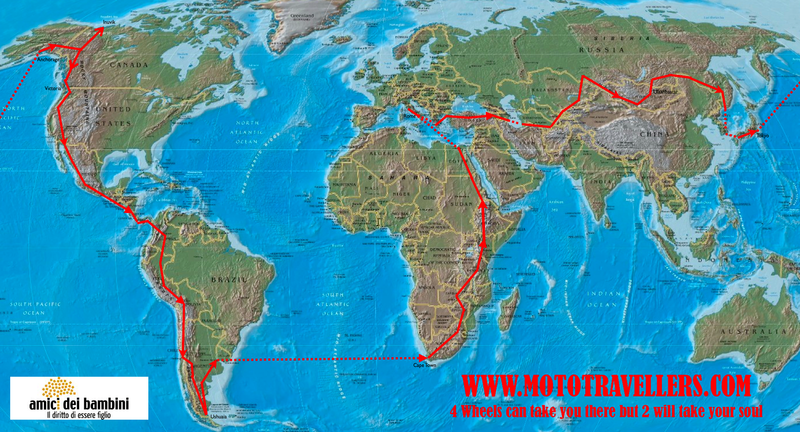 To start, my good friend Matteo and myself are planning to ride 15000 Km from Italy to Mongolia. The following year we will attempt to ride from Mongolia to Vancouver in Canada. Don’t know yet. To see what we have planned for the 2nd Segment, please visit the page “2nd Segment of our trip around the world”. Our intended route for the first segment is below. The idea came to life after finishing a great book from an Italian Author named Tiziano Terzani called ” Buonanotte Signor Stalin”. It is a fascinating journal on the changes of the old Soviet republics after the collapse of the Communism system in those region. We will try to document the journey the best we can. We will be writing in english but keep in mind we are both Italians therefore be prepared for many grammar mistakes. In order to follow the adventure check the menus “Photos “, ” Our Videos ” and ” Where are we now ? ” at the top of the page. A “live map” option is also available to show exactly our track/position with the help of “SPOT”. Matteo and myself were trying to find a cause that would help us “keep going” and find a mission for the trip. Travelling on a motorcycle alone is a great experience but sometimes it can be a little selfish and you wish you could do more. For this reason, we decided that we would try to put together some money through friends and family to help a non-profit organization present in Mongolia. 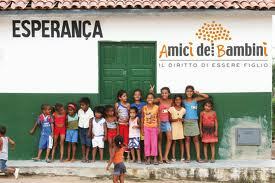 “Amici dei Bambini” is an organization that looks after abandoned kids in those rural areas. Upon our arrival, we will present a check with all we were able to gather, to one of the structure residing in the area of Ulan Bataar.If you are interested in participating in this “Good Cause”, please send us an e-mail for more details. Please read the facts below and visit their website on the left. Thanks. Mongolia is a very large country with the lowest population density in the world: a territory which is four times as big as France is home to only 2.5 million people. Its territory consists mainly of steppes and, to the south, of the Gobi Desert. The only city of average size is the capital, Ulaan Bataar. 36% of the population lives below the threshold of subsistence. Outside of the large urban areas, the majority of the population participates in subsistence herding. The country enjoys a continental climate, with hot summers and very cold winters, when temperatures can reach -50°C. According to UNICEF’ 2003 figures, there are 78,000 Mongolian orphan children between 0 and 18 years of age. In the capital city alone there are more than 20 reception centres that try, first of all, to recover the children’s documents, without which the children are but shadows without a future, and to provide basic services. Poverty, unemployment, alcoholism are the main causes of child abandonment in Mongolia. Degradation and destitution oblige many families to abandon their children. Street children have become a true emergency: thousands of them flood the streets of Ulaan Bataar. During the cold winters, many shelter in the city’s underground areas, next to the heating pipes. These are the “invisible” souls: with no identity documents, no possibility of social, health or educational care services, these children are at constant risk of being captured by child traffickers. Since 1986 Amici dei Bambini has been working to support children living in institutions all over the world and to fight against the abandonment emergency. Our Association operates in Italy with a national office and 9 regional offices spread throughout the country. Ai.Bi. also operates withdevelopment project in 25 world countries in Eastern Europe, the Americas, Africa and Asia. this is a former infant care hospital that has been transformed into a reception centre for orphans, social orphans or children from distressed families. It hosts 75 children between 1 month and 4 years of age. The project’s main goal is the improvement of social services offered by this institute, in an effort to define the legal status of the children cared for herein, in order to succeed in bringing them back into their families of origin or in introducing them into a substitute family (foster care, tutelage, national adoption and, in case, international adoption). A social worker pays visits to distressed families, offering parent support, to facilitate the children’s return within the family. this structure welcomes 30 adolescents between 14 and 18 years of age. The majority of the children has always lived within the institute. For these children, who are too old for adoption, Ai.Bi. supports the activities of the informal care-giver association called “A good idea”, to facilitate autonomous actions towards their occupational and social integration. this is a public structure caring mainly for social orphans and minors from distressed families. It hosts about 85 children between 3 and 6 years of age, mainly coming from the Sanatorium child clinic. The specific goals of this project are the strengthening of the child protection services for children entrusted temporarily or permanently to the institute and, whenever possible, the placement of each child with an appropriate family. A team of two social workers pays regular home visits to distressed families, providing parent support to promote the return home of the children. To this aim, training and consulting activities are available for the families, to promote responsible parenthood. This structure is supported also through donations of toys and educational materials. this is a three-year project that has started full operations in 2010, is co-financed by the European Union together with local institutions, the Ulaan Bataar university and other international and Mongolian NGOs. This project’s main goal is the improvement of the quality of and access to social services for the children and distresses families. support activities for at least 100 families, to prevent child abandonment, campaigns to involve public opinion in the issue of child abandonment. Ai.Bi. Associazione Amici dei Bambini and AiBi Inc. shares the same mission: to give back a family to every abandoned child living without parental care.